PHOENIX, AZ --(Marketwired - March 15, 2016) - uBreakiFix specializes in same-day repair service of small electronics, repairing cracked screens, water damage, software issues, camera issues and other technical problems at its more than 170 stores across North America. 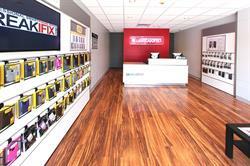 Its newest location, uBreakiFix Happy Valley, opened March 15 at 2501 W. Happy Valley Rd., between Walmart and GameStop. uBreakiFix has an average repair cost for electronics of $85. The company is known for its timely service and hassle-free customer experience, and offers repair services for all brands of smartphones, tablets, computers, game consoles and more. Each repair comes with a 90-day warranty. uBreakiFix Happy Valley is the first location for store owner Lisa Burns. Burns has spent more than a decade searching for the right business to provide to the Phoenix community before realizing the stress of finding a full-service technology repair store was a burden she shared with her community. Burns has plans to open stores in Desert Ridge and Lake Pleasant Parkway neighborhoods in the near future. "For my family, uBreakiFix has not only provided a one stop-shop to fixing our technology devices, but also a sense of security knowing that we will be given as much honest care and dedication as our devices," said Burns. "I am beyond thrilled that I can share this amazing resource with busy mothers, students and the entire community." To date, uBreakiFix has repaired more than 1.5 million devices. The brand opened 63 locations last year, and it expects to have 275 stores across North America by 2017. For more information and to view a service menu, visit ubreakifix.com. ​uBreakiFix specializes in same-day repair service of small electronics, repairing cracked screens, water damage, software issues, camera issues and other technical problems at its more than 170 stores in North America. uBreakiFix Happy Valley opened March 15.